The sight of large fields full of one type of crop ripening in the sun may now be a quintessential part of the countryside, but this mass-production method of cultivating a single species has long been known to cause problems. Large groups of the same crop make an easy target for pests. For this reason, non-organic commercial growers feel compelled to spray the whole area with pesticides. Soil nutrients are depleted when the ground is occupied by a large number of the same type of plant. This problem is compounded if the ground is used for the same crop next season – often the soil becomes so impoverished that artificial fertilizers are needed. And soil subjected to the same mechanical processes year after year will inevitably become compacted. While the gardener won’t be growing as intensively as the farmer, these problems may also be encountered on a smaller scale. You may see a drop in plant health and productivity if crops are grown in the same spot for many years. Combined with other organic methods (see our Natural Pest Control GrowGuide), rotation offers an excellent defense against all kinds of pests and disease. Simply divide your growing space into a number of distinct areas, identify the crops you want to grow and then keep plants of the same type together in one area. Every year the plants grown in each given area are changed, so that each group (with its own requirements, habits, pests and diseases) can have the advantage of new ground. Most crop rotation schemes tend to run for at least three or four years, as this is the number of years it takes for most soil-borne pests and diseases to decline to harmless levels. If your beds are divided into four groups, this means that members of each plant family won’t occupy the same spot more than once in a four-year period. Perennial vegetables such as soft fruit, rhubarb, asparagus and globe artichoke aren't replanted each year, so they may need their own dedicated bed. The traditional advice is well intentioned, but also flawed. It recommends that you divide crops into four main groups as follows: Legumes (bush beans, peas, pole beans, broad beans); root vegetables (radish, carrot, potato, onion, garlic, beet, rutabaga, sweet potato, shallots); leafy greens (spinach, chard, kale, cabbage, cauliflower, broccoli, spinach); and fruit-bearing(tomato, sweetcorn, cucumber, squash, pumpkin, zucchini, eggplant). These categories offer greater flexibility and allow a wider permutation of crops grown over the seasons. . In addition, our Garden Planner allows you to look back over five years of your plot’s history, warning you when you try to replant the same crop too soon and making it easier to design a longer rotation plan. Some vegetables are not prone to soil-borne disease, which means that they don't need to be part of your rotation plan. You can therefore sow plants from the Miscellaneous group (grey) wherever you have free space. Members of the Chenopodiaceae (pink) family, such as beets and spinach are also relatively unproblematic, and can follow most other crops. Brassicas follow legumes: Sow crops such as cabbage, cauliflower and kale on soil previously used for beans and peas. The latter fix nitrogen in the soil, whilst the former benefit from the nutrient-rich conditions thus created. Potatoes also love nitrogen-rich soil, but should not be planted alongside brassicas as they like different pH levels. Very rich soil and roots don't mix: Avoid planting root vegetables on areas which have been heavily fertilized, as this will cause lush foliage at the expense of the edible parts of the plant. Sow parsnip on an area which has housed demanding crops (such as brassicas) the previous season, since they will have broken down the rich compounds. Area 1: Enrich area with compost and plant potatoes and tomatoes (Solanaceae). When crop has finished sow onions or leeks (Allium) for an overwinter crop. Area 2: Sow parsnips, carrot, parsley (Umbelliferae). Fill gaps with lettuce and follow with a soil-enriching green manure during winter. Area 3: Grow cabbage, kale, rocket (Brassicas) during the summer and follow with winter varieties of cabbage and Brussels sprouts. Area 4: If this is your second or subsequent year, harvest the onions or leeks previously growing here over winter. Then sow peas and beans (legumes). When harvest has finished, lime the soil for brassicas which will move from area three to occupy the space next. "One of the best articles on rotations I've found. I still have some questions about into what families some plants would be classified. Basil, a mint, and yacon, a tuber - how would they fit into the rotation?" "Yes, very helpful, although as I have a very small plot and potatoes I grew last year did very well but in a space which doesn't get much sun so not much else can be grown there, would it be ok to plant potatoes in the same area this year. Your comments would be much appreciated. Many thanks. Mrs Maria Galcius"
"How far away do I have to move the tomatoes each year from last years plot? " 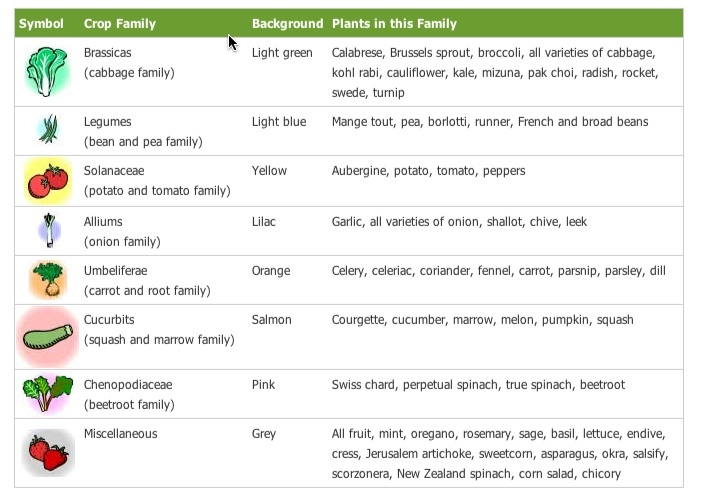 "clever classification of vegies,always struggle with "4 groups theory" beetroots? root crop, onions root crop?. your system gives me more opportunity to grow crops which are not related to each other but appear to be similar." "Where do you put sweetcorn?" "The Poaceae Family – includes sweetcorn and maize"
"Where do Cucurbits fit into the crop rotation order?" "relieved to hear that i can plant winter brassicas in the same bed as I had summer brassicas. Thanks for this info." "In your 4-area crop rotation example, you left off the most loved vegetables in the south - cucubris (melons, cucumbers). Typically cucubris follow root crops like carrots, followed by tomatoes. Where would cucubris fit into your recommended rotation plan? What comes before cucubris and after?" "nice your have helped me pass my course work"
"This year I had the experience of my beefsteak tomatoes crossing with my golden cherry tomaotes which has never happened before. Basically, how far apart should these plants be planted so this doesn't happen again?" "Would it be possible to use a three year/three areas crop rotation with the same principles as explained in your article (Crop Rotation for Growing Vegetables)? I really have only three growing areas available! Thank you : ) Anna"
"vegetable growing in countries like Uganda hasn't been successful to our expectations due to the low levels of technology in relation to plant breeding."